Throughout 2014, enjoy monthly Health Rhythms Drum Circle for Seniors at Lamorinda Music in Lafayette, California hosted by Kathy Quain, MME, MT-BC, Remo Endorsed Health Rhythms Facilitator and Founder of www.MusicForTherapy.com. Drumming has been used for centuries to improve health, create community and provide opportunity for creative expression. Benefit from Health Rhythms, a program based on research showing improved immune system. All seniors (age: 50 & over) are welcome even if drumming for the first time ~ no prior musical experience necessary. 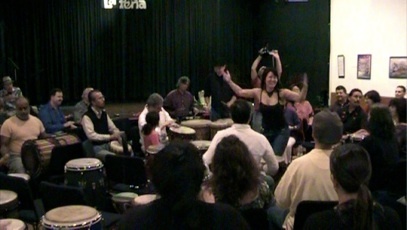 Pacific Drum Circles promotes community and wellness through Interactive Rhythm Events. Based in the San Francisco Bay Area, Kathy Quain gathers people of all walks of life through joyful music making. For over ten years Kathy tailors Drum Circles for Festivals, Conferences, Teambuilding Workshops and more.